It’s actually slightly embarrassing that instead of blogging about all the significant or interesting or deeply-personal things that have happened to me in the last few weeks, I’m going to post a link to the iPod nano, but I just wanted to hear your comments. It has a color screen. It has 14 hours of battery life per charge. 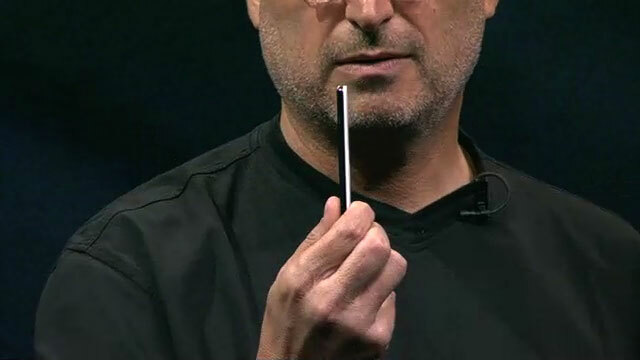 It’s thinner than a standard “No. 2” pencil. Now you know what that secondary, tiny pocket nestled inside your front-right jeans pocket is really for. I’m not personally planning on buying one since I just got a 60 GB iPod last week (my previous one was suffering from old age and abuse), but man, if I didn’t have an iPod, and if my music would fit in a 4 GB space, I’d be all over it. The link says it only has 4GB of space – did I miss the 6 GB part or did you mistype? Just curious. I’ve been thinking I want an iPod Shuffle, but now that I’ve seen this one, I’ll think I’ll hold out a little longer…. D’oh! You’re right. There are two models: 2 GB and 4 GB. I think I had a “6” in my head from the 60 GB one I wrote about. Fixed! Thanks. I like it but my shuffle currently handles my sports music needs and the rock solid 1G (yeah, it is still working after like 4 years) handles tunes in the homestead. I think I’ll wait another generation or two before dumping the 1G. I also feel compelled to point out that Wikipedia already has an iPod nano entry up on their site. I just love that. That’s 24-hours, people. New entry. Bingo. I think it’s pretty cool and all, but the $200 price tag seems pretty high. I guess I always wish the fun toys were cheaper. I’m also a bit surprised that they did away with the colored iPod Minis. Those were very fashionable and managed to make fans out of quite a few teen girls who otherwise wouldn’t be so excited about a music player. White and black just isn’t the same as pink, blue and green. And yes, I think we’d all like to see everything be cheaper. The point is, the nano is worth that price tag. Here’s another solution for those wanting colorful nanos. Check it out. I like that orange one. This is the first iPod that really makes sense for me given my music habits and the normal ways I have access to them. In other words, it hit my sweet spot on a niche musical need/want and so I ordered a black 4GB one. Also, the non-Steve Jobs presenters at that conference were just painful. I took my headphones off to avoid them while the video played. I’m not saying Jobs is super great, but thank goodness he’s listenable. I think the teenage girl population would disagree with you. There’s a big difference between customizing your iPod to get the color you want vs. it coming in the color you want. As for the price, $250 for 4 GB. A year ago I paid $50 more for 10x the space. $300 for 40 GB (not including any discounts). Maybe you can argue that it works out, but I just wish you could get more space. Everybody else may be happy with 375 songs, but I’m not. Well said, Kevin! That’s precisely why the nano isn’t for you. You’re not the type of customer who would want one. Neither am I. That’s why I’ve got a 60 GB iPod photo.